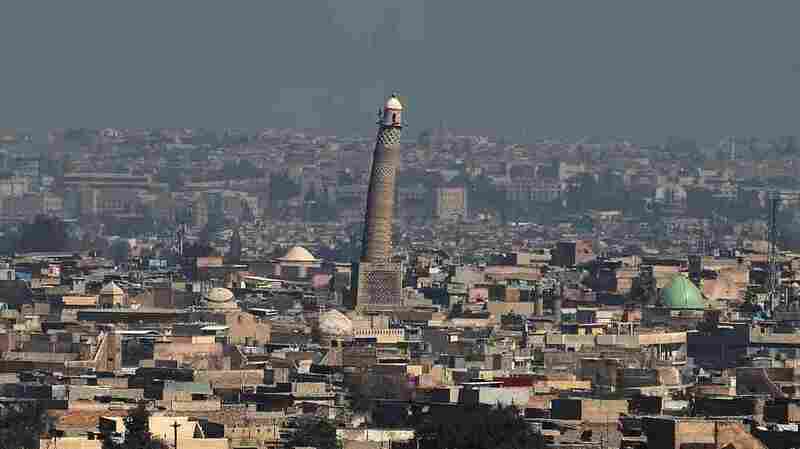 ISIS Destroys Historic Mosque In Mosul As Iraqi Forces Close In : The Two-Way Iraq's military said ISIS destroyed the 12th century al-Nuri mosque in Mosul's Old City, where ISIS fighters remain. Iraq's prime minister called it "a formal declaration of their defeat." The Great Mosque of al-Nuri in Mosul, with its tall, leaning al-Hadba minaret, was where ISIS leader Abu Bakr al-Baghdadi declared the group's "caliphate" in Iraq and Syria in July 2014. Iraq's military said ISIS destroyed the 12th century al-Nuri mosque in Mosul's Old City, where ISIS fighters remain, on Wednesday. The Great Mosque of al-Nuri, a medieval mosque with the tall, leaning al-Hadba minaret, was the site where ISIS leader Abu Bakr al-Baghdadi made a rare public appearance and, in July 2014, declared the group's "caliphate" in Iraq and Syria. "Daesh's bombing of the al-Hadba minaret and the al-Nuri Mosque is a formal declaration of their defeat," Iraqi Prime Minister Haider al-Abadi tweeted, according to an Associated Press translation. Daesh is an Arabic acronym for the Islamic State group. Iraq's military said ISIS fighters used explosives to blow up the more than 800-year-old mosque, the AP reports. "This is a crime against the people of Mosul and all of Iraq, and is an example of why this brutal organization must be annihilated," Maj. Gen. Joseph Martin, who commands coalition ground forces in Iraq, said in a statement Wednesday. ISIS media arm Amaq claimed a U.S. airstrike was responsible for the destruction. U.S. Army Col. Ryan Dillon told the AP that the U.S. "did not conduct strikes in that area at that time." The Iraqi military said its counterterrorism forces were within 165 feet of the mosque when it was destroyed. A video on social media shows what it says is the explosion. "The mosque was named after Nuruddin al-Zanki, a noble who fought the early crusaders from a fiefdom that covered territory in modern-day Turkey, Syria and Iraq. It was built in 1172-73, shortly before his death, and housed an Islamic school. "By the time renowned medieval traveler and scholar Ibn Battuta visited two centuries later, the minaret was leaning. The tilt gave the landmark its popular name: the hunchback." ISIS militants have targeted other historic sites for destruction, including ancient outdoor structures and artifacts in museums in Syria. ISIS forces have been driven from most of Mosul but still control about 1.5 square miles of the city, according to The Wall Street Journal. The mosque was in the Old City area, where remaining ISIS fighters are making a final stand with an estimated 100,000 civilians being used as human shields. Mosul is the last major city where ISIS controls territory in Iraq.